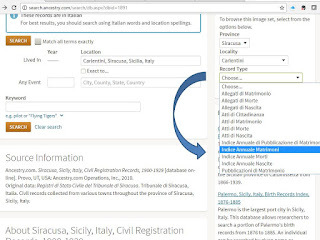 Did you know that Ancestry.com has Italian Vital Records hidden on their website? This little known secret has enabled me to trace many of my Sicilian ancestors and cousins in the records of the old country. Oh yes you will need to be able to read Italian records to decipher the contents of these records. I can help you with that. By clicking on the search result, you are taken to the following web page. DO NOT USE THE SEARCH ENGINE. You need to use the locality drop down boxes to browse the records because they are not indexed through Ancestry.com. However, there are indexes in these record sets as you will learn momentarily. Towards the top of the page on the image above, you can see the bent arrow that I added to the image which states: "To browse this image set, select from the options below. 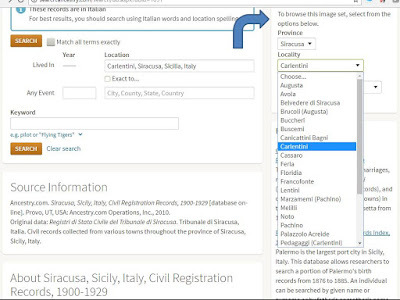 Carlentini is one of the localities available in the drop down box. The next step is to select the Record Type that you want to browse. In this case we are looking for a marriage that we think happened about 1903 so we select "Indice Annuale Matrimoni." This translates to Annual Marriage Index. After selecting the Indice Annuale Matrimoni, a list of years appears and I selected the year 1903 and this is the image that appears. This is the part that takes a little bit of knowledge and experience with the Italian records to decipher the Italian words and handwriting. The first column header is "COGNOME E NOME" which translates to "SURNAME AND NAME." The next column header is "Num. di Registro" which spelled out is "Numero di Registro" which translates to "Register Number." However there is a lot more here than just the name of the bride and the groom. The first line reads: "Cimino Antonino di Sebastiano e di Grasso Carmela." In this case the name of the groom is Antonino Cimino and his parents are Sebastiano Cimino and Carmela Grasso. One thing that you do not see is the prefix "fu" which means "late" or "deceased" so in this case the parents of Antonino Cimino are both still alive in 1903. Antonino Cimino is my great grandfather. A few years after he was married, he immigrated to Omaha, Nebraska. The next line gives the name of the bride Maria Ossino and her parents Giovanni Ossino and Concetta Bruno who were also still alive in 1903. Maria Ossino is my great grandmother and she immigrated to Omaha in 1911 and by that time she had three children whose birth records also appear in these "Hidden Italian Records." The next two lines show the marriage record of Filadelfo Calafiore to my great grandfather's sister, Lucia Cimino. We know that because the names of the parents of Lucia Cimino are also Sebastiano Cimino and Carmela Grasso. The father of Filadelfo is Giuseppe Calafiore and he is still alive. The mother of Filadelfo is "the late Sebastiana Marino." Notice how the surname is written first and the given name is written second. Sometimes this leads to confusion for an indexer or researcher that is unfamiliar with Italian records. By noting the register numbers of 46 and 47, we can then find the complete marriage record by going back and browsing the "Atti di Matrimonio" which we would call "Marriage Records." 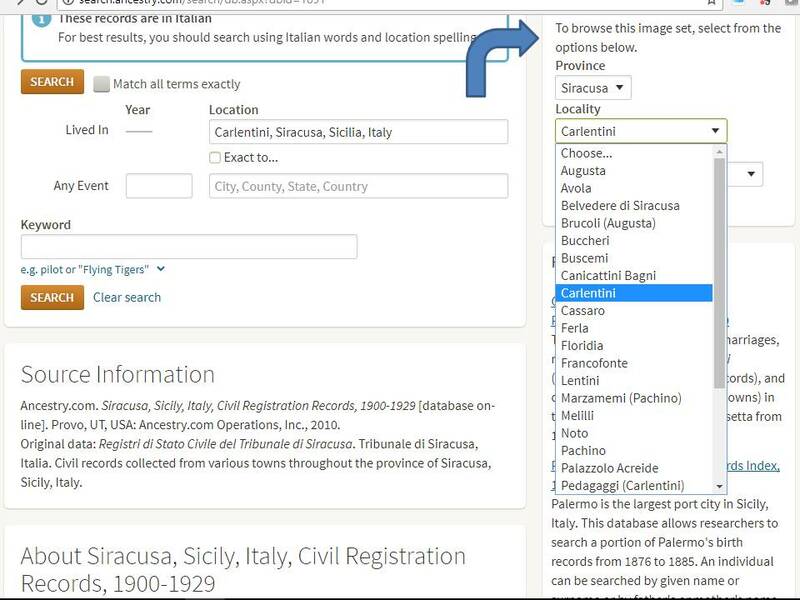 As you can see in the above image, this record set for Carlentini in Siracusa Province covers the period 1900-1929. This is a very valuable period as it includes many marriage and birth records for many of the immigrants that came to the U.S. Similar records are available for many Italian towns. Not every province has these records available on Ancestry.com. For example in Sicily there are only three provinces covered: Agrigento, Caltinisetta, and Siracusa. There are four provinces in Lombardy: Como and Lecco, Lodi, Pavia and Varese. Most other localities are dependent on microfilm at the Family History Library in Salt Lake City. For example here is a complete list of the 32 microfilm available in Salt Lake City for Carlentini. Nati is birth, Matrimonio is marriage and Morti is death. 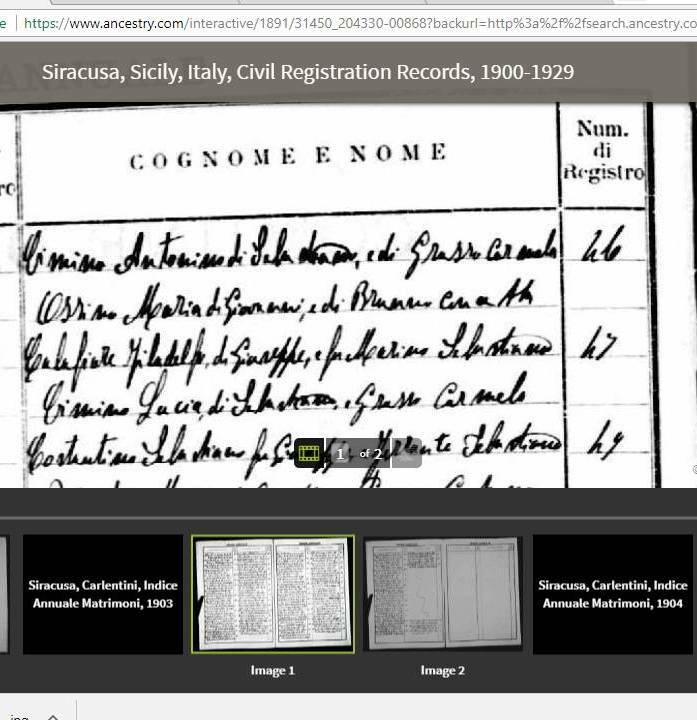 The only records above that have been digitized on FamilySearch.org are the records with the camera icon. 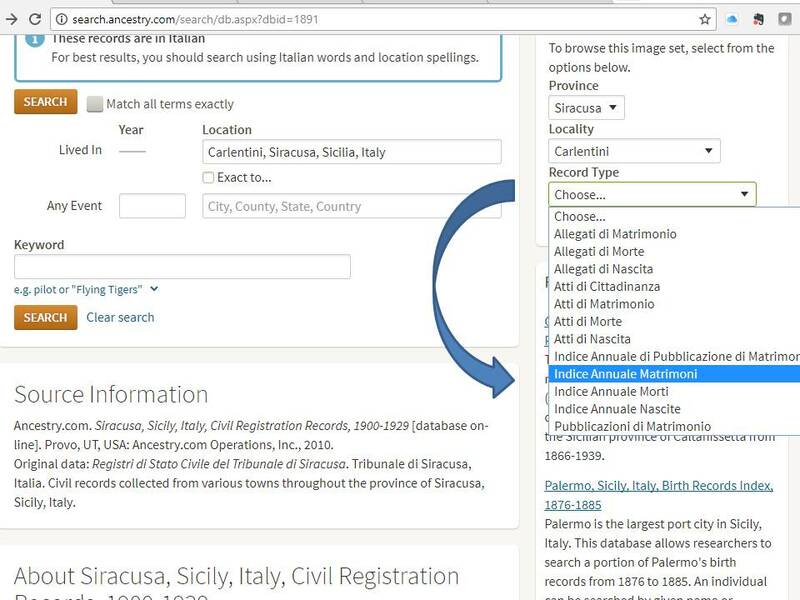 This is another reason why these "Hidden Italian Records" on Ancestry.com are so valuable to genealogists with Italian ancestors. Contact me if you would like help accessing records for your Italian ancestor.